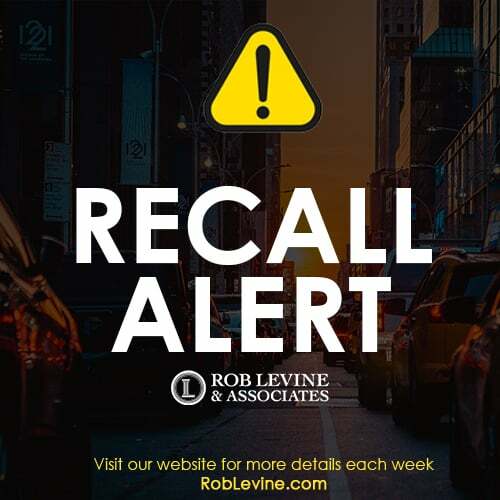 Rob Levine & Associates publish monthly recall updates o that you can stay up to date on the products you use daily. Products including vehicles, products, food, etc., are constantly being recalled for danger risks. Stay up to date with us. Hot Mom is recalling 500 baby bed rail model Boom09. These models do not meet the federal mandatory standard for bed rails. Manhattan Toy is recalling select Children’s Soft books. These fabric books have a metal grommet in them used to attach the fabric to the binding. This grommet can detach and create a choking hazard. Lotus Foods is recalling select rice ramen noodle soup cups. The 2oz ramen noodle soups packaged in paper cups are in fact not microwave safe. If microwaved there may be a risk of burns or fire. Navien is recalling tankless water heaters and boilers. A kit installed inside the machines can produce an excessive amount of carbon monoxide, creating a high risk of carbon monoxide poisoning. Miles Industries is recalling Valor H5 gas fireplaces. The trim around the fireplace can leak hot exhaust air, which can potentially be a burning hazard.